We had been seated, ready for the conductor’s downbeat for what seemed an eternity. The audience sounded restless. Tosca, starring Luciano Pavarotti was ten minutes late in getting underway. I had been playing with the Pittsburgh Opera Orchestra long enough to know that this delay was highly unusual. Finally the stage manager appeared. He announced that Pavarotti was being treated by three doctors for a vocal problem. The opera would begin as soon as possible. Thirty minutes later Pavarotti’s personal conductor, a fine musician who did his utmost to support Pavarotti, gave the downbeat; and the curtain opened on Act One. Pavarotti struggled through one aria after another until the opera’s closing minutes. We all knew the critical high C was coming. We played on, hoping, willing the great artist to make it to the final curtain. On the leap to the high note his voice cracked. Pavarotti stopped singing. The conductor stopped the orchestra. Pavarotti came to the edge of the stage and looked down. He told the conductor to start the aria over again. Pavarotti’s conductor, a little Italian man who flinched every time his boss spoke, turned this way and that, hissing frantically, “Beginning of aria, please.” Flip, flip, flip, flip, flip, sixty players paged back to the beginning of the aria. We began again, and again the grand tenor missed the C. Only this time he held his throat and rasped, “I’m very sorry.” Head bowed, he walked off the stage. No one stirred. After an uncomfortable silence, the Opera manager emerged from the wings. “We are very sorry the maestro has taken ill and cannot complete this performance. Those who wish to do so, please contact the Opera office to receive satisfaction. Good night.” Two days later I was back in the pit playing Tosca again, with a tenor from the Met and a new conductor. After I graduated from Oberlin College with a performance degree, I joined the Baltimore Symphony and continued studying violin performance at the Peabody Conservatory. I returned home to Pittsburgh after three years with the Baltimore Symphony intending to take a graduate assistantship at Ohio University in the fall. Instead, I took advanced studies locally at Duquesne University. In 1978 my family and I moved from Chicago to Erie at which time I joined the Erie Philharmonic and the Erie Chamber Orchestra. During those first few years in Erie I took additional advanced violin studies at SUNY in Fredonia, New York. By 1980 I had become a member of the Chautauqua Symphony Orchestra, retiring in 2002. Also in the eighties I established the University String Quartet. We were in residence at Mercyhurst University until 1987. When the Pittsburgh Opera/Ballet Company formed its own orchestra in 1987, instead of using Pittsburgh Symphony players, I auditioned successfully and enjoyed playing in that group for ten years. 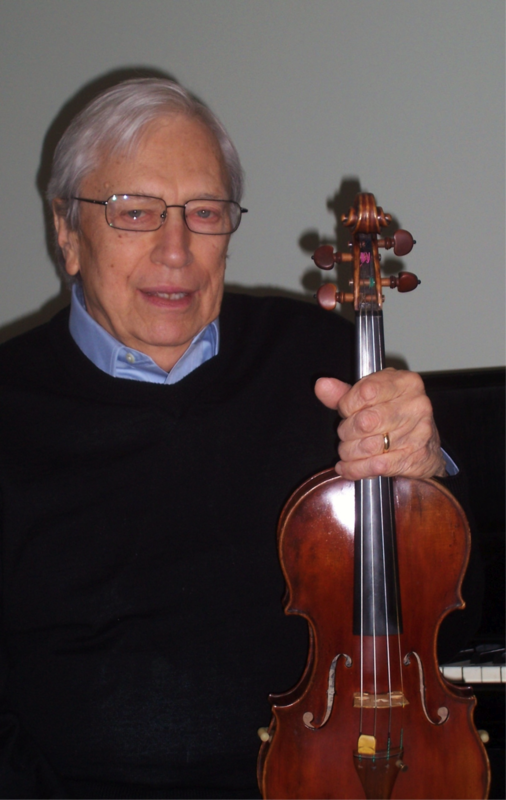 Since retiring from the Erie Philharmonic in 2010, I have been devoting much of my time to my private violin students, many of whom have won local competitions and significant scholarships. And I’m happy to still be a part of the Erie Chamber Orchestra.